Today I’m writing about how to make money with subscription boxes. I’m referring to those of us who love to get subscription boxes every month. The subscription box industry seemed to take root and begin to flourish in 2010. The launch and success of Birchbox became proof that subscription boxes were here to stay. Since then, thousands of successful subscription box companies have sprung up to provide monthly boxes for anything you can imagine. Customers can subscribe to one month, three, month, or six month subscriptions. Each month, millions of subscribers receive food / snack subscription boxes, fashion subscription boxes, makeup subscription boxes and more. As a general rule, the items in a subscription box have a total value higher than the price paid for the box. Those of you looking for a place to find the best subscription boxes can look no further. The Find Subscription Boxes (FSB) subscription box directory has a box for everyone. Since launching in 2013, FSB continues to be a top subscription box directory in the industry. 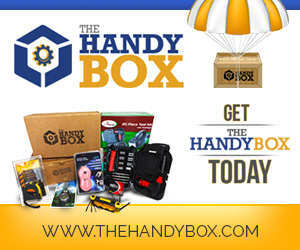 Find Subscription Boxes has recently launched an online marketplace for subscription box fans – The Aftermarket at Find Subscription Boxes. 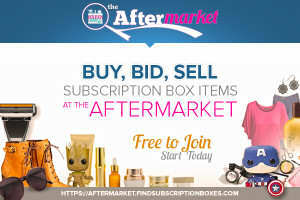 At The Aftermarket, subscription box addicts, lovers, and fans can sell their subscription box items. Anyone can make money by setting up a store to sell their subscription box items. Not only that, they can auction valuables and collectible subscription box products to the highest bidder. It doesn’t matter if you subscribe to monthly nerd boxes, geek boxes, or makeup boxes. At The Aftermarket, you can sell the item if it came in a subscription box 🙂 Each seller has full control of product pricing, shipping, and more. Sellers also have their own storefront to display all of the items they have for sale. There are no fees except for a minimal commission from each sale. There are many more benefits to becoming a member of The Aftermarket at Find Subscription Boxes. All members have their own member profiles which are showcased when participating in the Aftermarket social network. They can upload photos, videos, and status updates. Have you ever wanted your own blog? By joining The Aftermarket, everyone has their own free blog where they can post there personal thoughts each day. It’s free to open a store. What are you waiting for? Visit The Aftermarket at Find Subscription Boxes and open your free online store. It’s time to to earn money by selling the subscription box items you don’t need.